Shrewsbury Town held high-flying Gillingham to a League One draw in foul conditions at the Greenhous Meadow. Town took the lead when midfielder Ian Black's free-kick was headed into his own net by Deji Oshilaja. But the Gills hit back through Cody McDonald's close-range finish and Ryan Jackson's stunning 25-yard drive. The hosts had the last word when Scott Vernon teed up skipper James Collins to flick a shot past Stuart Nelson for his third goal in four games. Coming on the back of Tuesday night's 4-2 win at Sheffield United, Micky Mellon's men are now two points clear of trouble. "A very good point for us against a very good Gillingham side. The weather conditions were awful - the worst conditions since I've been here. It was driving rain, the wind was rough too." "We have a number of qualities in this team. We'd have taken four points this week after going away to Sheffield United on Tuesday night. "We have the players fitter than they've ever been. We have to be fit at this level for the mental toughness to keep going until the final whistle. "And our goalkeeper is brilliant. I'm not surprised he's pulling off those type of saves. That's the greatest compliment I can pay him." Match ends, Shrewsbury Town 2, Gillingham 2. Second Half ends, Shrewsbury Town 2, Gillingham 2. Attempt saved. Ryan Jackson (Gillingham) right footed shot from outside the box is saved in the bottom left corner. Doug Loft (Gillingham) is shown the yellow card for a bad foul. Foul by Doug Loft (Gillingham). Ian Black (Shrewsbury Town) wins a free kick on the right wing. Corner, Shrewsbury Town. Conceded by Bradley Garmston. Anthony Gerrard (Shrewsbury Town) is shown the yellow card for a bad foul. Foul by Anthony Gerrard (Shrewsbury Town). Cody McDonald (Gillingham) hits the right post with a right footed shot from the centre of the box. Ryan Jackson (Gillingham) wins a free kick on the left wing. Corner, Gillingham. Conceded by Jermaine Grandison. Goal! Shrewsbury Town 2, Gillingham 2. 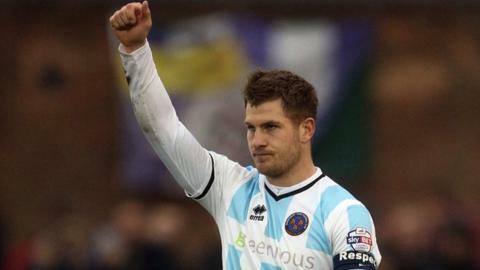 James Collins (Shrewsbury Town) right footed shot from the right side of the box to the centre of the goal. Assisted by Scott Vernon. Adedeji Oshilaja (Gillingham) wins a free kick in the attacking half. Foul by Larnell Cole (Shrewsbury Town). Ian Black (Shrewsbury Town) wins a free kick in the attacking half. Jermaine Grandison (Shrewsbury Town) wins a free kick on the right wing. Attempt blocked. Doug Loft (Gillingham) right footed shot from outside the box is blocked. Nathaniel Knight-Percival (Shrewsbury Town) wins a free kick on the right wing. Goal! Shrewsbury Town 1, Gillingham 2. Ryan Jackson (Gillingham) right footed shot from outside the box to the top left corner following a set piece situation. Bradley Garmston (Gillingham) wins a free kick in the defensive half.